It is within this context that I am interested in exploring the recent proliferation of both upscale and down-home “soul food” restaurants in Oakland; what a San Francisco Chronicle story termed a “soul food renaissance.”5 Although three out of the four restaurants profiled in that Chronicle story had closed their doors by the end of last year, others, such as Tanya Holland’s Brown Sugar Kitchen, were taking root. These restaurants are intriguing locations for thinking through the politics of food and place. They present food rooted in a Black Southern cultural repertoire—fried chicken, greens, sweet potato pie—with a twenty-first-century sensibility—local, sustainable, chef-driven, seasonal ingredients. Brown Sugar Kitchen takes its clues from this “new food movement” by emphasizing its use of fresh, local, and sustainably produced foodstuffs. Chef Holland seeks to bring the culinary influences of the Caribbean, New Orleans, California, and her classical French training to bear on soul food. 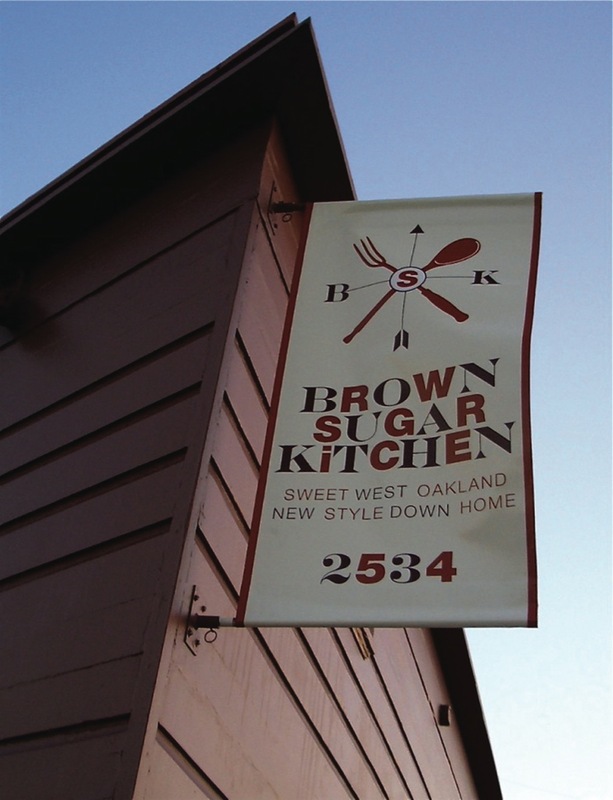 In many ways, Brown Sugar Kitchen is part of a culinary movement that one might argue has its origins in Alice Waters’s “delicious revolution”6 of the 1970s and the Black Power Movement of the late 1960s. In December 2011, I sat with Chef Holland in the dining area of her West Oakland restaurant for one of two interviews about her work as a chef, restaurateur, culinary entrepreneur, and nascent community leader. We followed up our conversation several months later, just as her restaurant was being featured in the June issue of O: The Oprah Magazine. What follows is a distillation of our conversations. Kimberly Nettles-Barcelón: Chef, talk me through your signature dish—the fried chicken and cornmeal waffles. 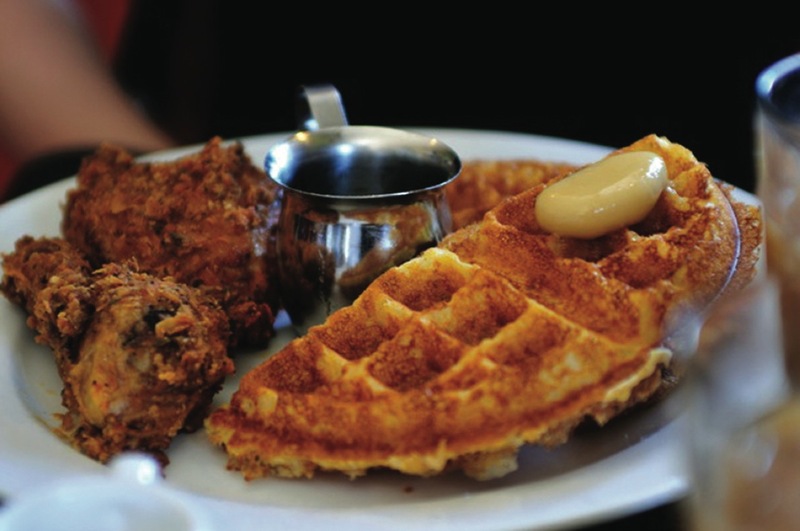 Chef Tanya Holland: The chicken and waffles came about as a sort of accident, and was in many ways dictated by the space. We have one griddle and six burners, so doing pancakes or French toast for breakfast wasn’t feasible. But it’s easy to plug in some waffle machines. And then we added the cornmeal to the waffle to capture the sense that people often eat fried chicken with cornbread. So it really marries the sweet and the savory sides of the dish well. And then we wanted to make something that sourced good ingredients, like organic chicken, dairy, and so on, and do the chicken and waffle really well. We wanted to make it unique. Nettles-Barcelón: And what about the vegetarian jambalaya? Holland: You mean dirty rice … yes, that was also something that came out of being in this place in this area. I know that there are a lot of people who are limiting their meat intake or are vegetarian, and while I love the whole chicken gizzards and liver you normally find in dirty rice, I knew that I wanted to make a dish that had all of those flavors without the meat. That dish is something I actually created before the restaurant happened and I brought it onto the menu because I thought it would work. Nettles-Barcelón: How did you come to feature soul food? And do you find yourself constrained by the category? Holland: Before I started this restaurant, I would say that I was cooking multi-ethnic cuisine. My cooking, like most chefs, has been influenced by cuisines from all over the world. I’ve cooked all over the place in many different types of restaurants and just my own palate leads me to pick-and-choose from the variety of cuisines out there in terms of the foods I prepare. So, ‘soul food’ as a genre. When I made the decision that this is the direction I was going in, I realized that I wanted this to be my mission—to do for soul food what we’ve seen done in other cuisines. To really elevate it, to bring it to a level of sophistication that is not expected for ‘soul food.’ Soul food has the reputation of not being seasonal, of being full of animal fat, etc. And I wanted to show that it is and can be seasonal and less reliant on smoked pork and still be flavorful and true to those authentic soul food tastes. Nettles-Barcelón: Is doing soul food or the expectation that you will do soul food connected to your being an African American woman? Holland: Some of it is that. After doing the Food Network show [Melting Pot: Soul Kitchen, cohosted with Cheryl Smith] and my cookbook, I got sort of pigeon-holed. And I think that black male chefs have been able to break out of the soul food genre more so than black women. But really I have found it a marvelous way to make visible a cuisine that is not thought of in certain ways. You don’t see chefs of soul food restaurants being nominated for James Beard Awards, for example. Nettles-Barcelón: Tell me about the restaurant’s space. You said before that there is often a difficulty in restaurants where either the space is right or the food is, but not both. What does it mean for you to get the “space and the food right”? Holland: I wanted to create everyday food for everyday people. I can’t help but bring my background, in terms of my formal culinary training and sophistication, into the food. But, I wanted to make it really accessible and authentic to whatever the dish is. You know how you go into restaurants and food can be off-putting? I didn’t want that; I wanted people to be able to come in and really enjoy and connect to the food and the experience. We inherited the space—how everything is configured—and so we decided to work with what was here and create the sort of atmosphere that would shape the kind of experience people may have been missing in Oakland. We are like a food oasis in a food desert. Something here makes people trek long distances to get here to get our food. Nettles-Barcelón: I’m remembering that when I came early on a Sunday I was struck by how people were milling about outside waiting to get in. Then, at some point, a guy with a piano set up outside and started playing music. People were sitting on the curb, drinking coffee, talking to each other. It was quite the scene … and this is before even getting inside to eat! Holland: Yes, and there again, that just sort of happened organically. The space itself is small and so during our busy times it can be a wait to get a table. And people don’t just leave and go down the street to the next restaurant—there is no next restaurant—instead, they treat that wait time as part of the experience itself. And so we started making coffee available to folks who are waiting outside… and it’s sort of like an adventure. 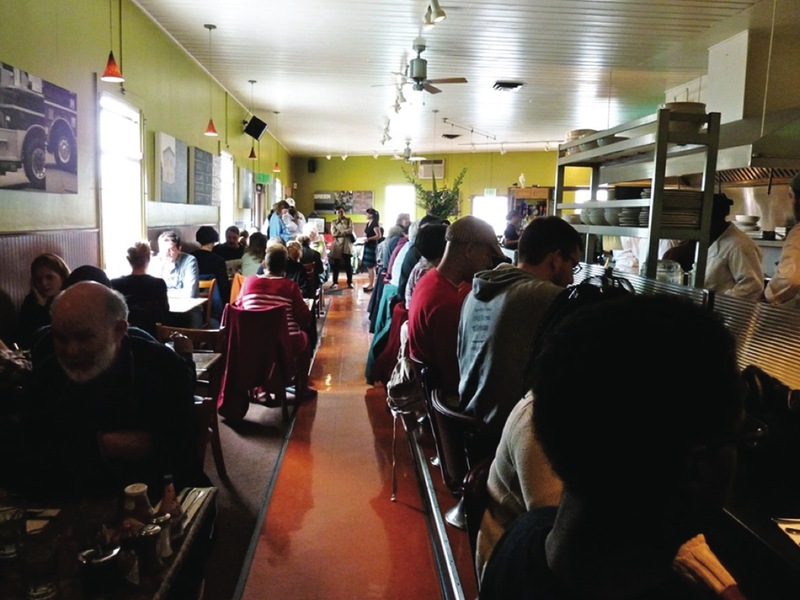 Like people are saying to themselves: “We’re here in the midst of industrial West Oakland hanging out and socializing!” So the outside serves as an extension of the experience inside the restaurant. Inside the restaurant I had a vision about how I wanted the space to feel. So I spent a lot of time choosing paint colors, art for the walls—by a local artist, Amanda Williams—new rugs, the music we play. All of that. We haven’t been able to change the table tops yet, but we got new chairs. And then the small things like the salt and pepper shakers. I wanted something in particular—somethingthat could hold the courser-grained sea salt and freshly ground pepper—which we grind ourselves here. Shakers that were rustic, yet elegant. And choosing Tabasco and Crystal hot sauces. All of those small things are intentional. They are designed to create an atmosphere that invites people in and that they know what to expect when they come in. Nettles-Barcelón: I understand people travel from all over the Bay Area and beyond to come to the restaurant, but I can also imagine that there are a lot of local people who are regulars. Holland: Yes, yes. I kind of get to do a bit of sociology by being a restaurateur. And what I’ve found is that people are really particular about their breakfast foods, lunch too, but especially breakfast. We like certain things, and once we find them, we don’t like to deviate too much. I think people are more adventurous at dinner time. We’ve got regulars who come in every week and we know who they are sometimes not by name, but by what they order. So like “Here comes two pieces with a side of biscuits.” You know? Nettles-Barcelón: So, is there a lot of variation in your menu? Holland: No, that’s the thing that’s been an adjustment for me as a restaurateur. The menu doesn’t change much at all. 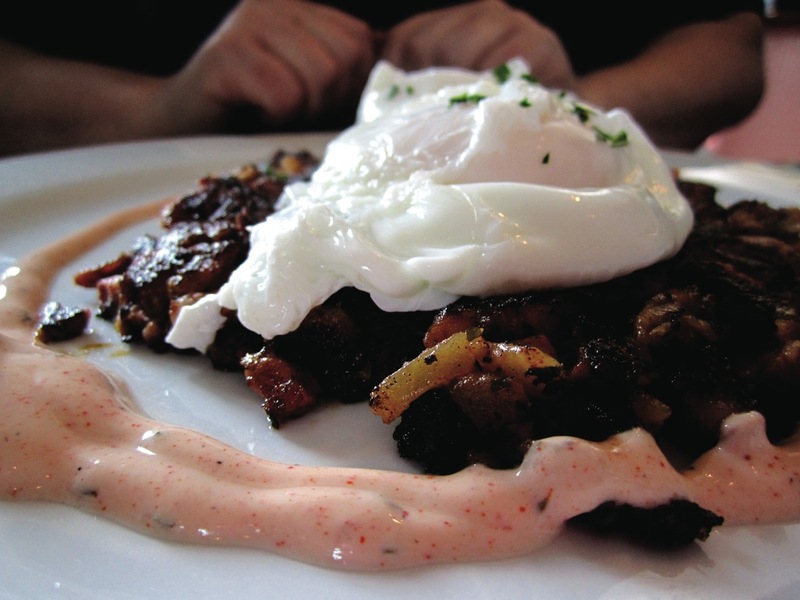 We have some daily specials that shift in and out, but the core of our menu stays the same. And what I’ve found is that Brown Sugar Kitchen is an exercise in perfection and consistency. And that’s really the name of the game in this business. People have to know that when they come in, whenever they come in, and order their favorite dish, that it’s going to be as good if not better than it always is. So we are seeing ourselves as becoming a sort of institution in this area, through the consistency our food. Nettles-Barcelón: I like this idea of your becoming an institution in this town. I know you came to Oakland without a whole lot of planning to be here. Holland: I’ve lived in Oakland the longest I’ve lived anywhere other than Hartford, Connecticut, where I grew up. And I landed here through a process of testing out various areas in California. I lived for a time in San Francisco, and I just didn’t care for that. I thought about Napa because I just love wine country, but I didn’t think it would be a good place socially; there’s issues of lack of diversity there. And I considered Berkeley for a while. But I settled in Oakland because I feel really at home here in ways that I never felt even in Manhattan or Brooklyn. The thing about the East Coast is that the pace of life is so fast, and it’s more difficult to slow down and really connect with people. Here I feel like the pace is more European. People care more about other people, and there’s an idea that we should strive to cultivate some work-life balance. Of course, that’s difficult to do in this industry—achieve balance—but there’s more of an expectation that we should do more in our lives than just work. 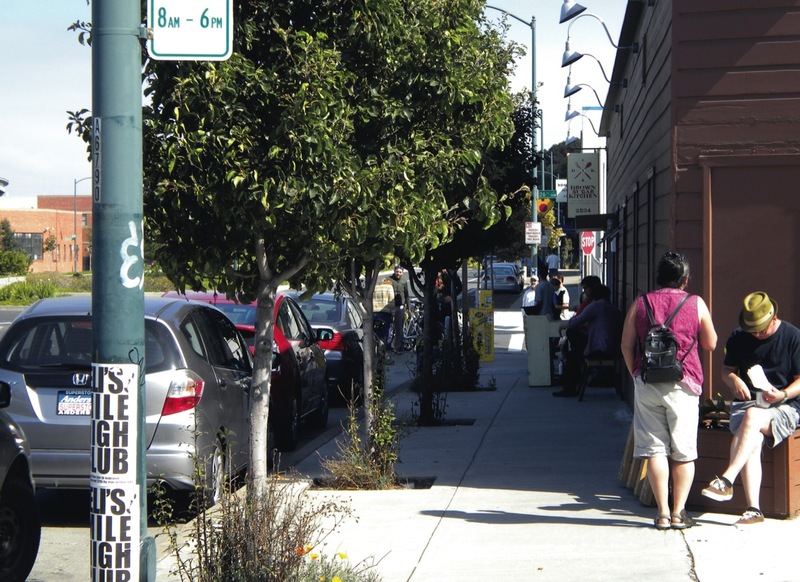 Nettles-Barcelón: How do you deal with people’s ideas about Oakland as dangerous and poverty ridden? Holland: Oakland has a bad reputation. But, again, I’ve felt so at home here. Ever since my husband and I decided to move into West Oakland and then set up the restaurant here, I’ve felt like it’s part of my mission to bring Oakland good press. And that’s what I see the restaurant doing: creating a positive buzz about Oakland, about it being a good place to be an entrepreneur, a good place to do interesting things. You know, I’m not that politically oriented. Meaning I don’t want to engage in politics directly, but what I do like to do is use my role in the community to empower people. But because I have been seen as someone who can get things done, I have been called upon to host political events and activities, to sit on various boards and be involved in the Chamber of Commerce. I actually have good relationships with the current Mayor, and several City Council members have come to us about issues or asked to use our space. But I try to maintain a very nonpartisan approach. I am for the improvement of Oakland, for allowing dialogue and change to happen organically. I’ve been involved in two organizations that have meant a lot to me both personally and professionally. I was one of two women of color inducted into the local chapter of the prestigious Les Dames d’Escoffier. I don’t know that there are any other women of color locally or nationally within that organization. That means a lot to me and the work that I’m trying to do here. And, then, more locally I sit on the board of the Women’s Initiative for Self Employment. This organization really strives to empower women to think about what’s possible for them … and provides them with tools to help them make some of their ideas come to life. Nettles-Barcelón: Speaking of these sorts of leadership roles, how do you approach mentoring within your restaurant? I remember in our last conversation you said that people still walk in and comment on how it’s good to see brown people in the kitchen … that this is not a common sight in upscale or higher-end restaurants. And, then you also mentioned how you wanted to mentor others in ways that you were not always mentored. Can you speak a bit more about that? Holland: My approach with leadership and mentoring is to lead by example. I always tell my staff that we are an open book here. So they are able to see all aspects of how the business is run, from testing recipes, to costing/financials, to working with the press, to direct customer service. All of that is part of this industry. And since I have been successful in working with the press to get our story out there, the staff are able to see other aspects of this industry—like for instance for the O Magazine spread we had a photo shoot with them and some of the staff got to experience what happens in food styling. All of these sorts of opportunities are available for my staff so that they can see ways to advance themselves within this profession. It’s not always just about the cooking. There’s so much more. One of my staff members is interested in the fashion industry and she learned of the Women’s Initiative for Self-Employment through my work with them and she’s going through their program. My husband and I gave a small business loan to help her pursue that. I recently had some conversations with one of the cooks here who was considering the hospitality program at a college, looking to get his bachelor’s degree. And I was able to suggest people I knew who could talk to him about whether that particular program was a good one, or whether he should consider a different program. I mean we are almost like an extended family here because we spend so much time at the restaurant it becomes like a family. With the way things are now, families are so splintered with people living all over the country or even the world … such that the workplace becomes that. My husband and I work hard to make it not so much a dysfunctional family, but a functional one: one where we can support and nurture each other’s strengths and help people to work on their shortcomings. We try to make it a place where people want to come to work and feel supported in this environment. 1. On the Black Panther Party and its Free Breakfast Program and Free Food Giveaway programs, Andrew Warnes’s brief, but compelling, analysis is worth reading—Hunger Overcome? Food and Resistance in Twentieth-Century African American Literature (Athens, GA: The University of Georgia Press, 2004). See also the striking photo collection of Stephen Shames, The Black Panthers (New York, NY: Aperture Foundation, 2006) and Alondra Nelson’s meticulous investigation of the BPP’s work on issues of health care in Body and Soul: The Black Panther Party and the Fight Against Medical Discrimination (Minneapolis, MN: University of Minnesota Press, 2011). The politics/pleasures of “soul food” is also well-discussed in Amiri Baraka’s “Soul Food” (from Home: Social Essays. Ecco Press, 1966), Marvalene Hughes’s “Soul, Black Women, and Food” (in Counihan and Van Esterik’s edited volume, Food and Culture: A Reader, Routledge, 1997), Nettles’s “’Saving’ Soul Food” (in Gastronomica, 7, no. 3), T. Poe’s “The Origins of Soul Food in Black Urban Identity: Chicago, 1915–1947” (in Counihan’s edited volume, Food in the USA: A Reader, 1999), and Doris Witt’s Black Hunger: Food and the Politics of U.S. identity (Oxford University Press, 1999). 2. 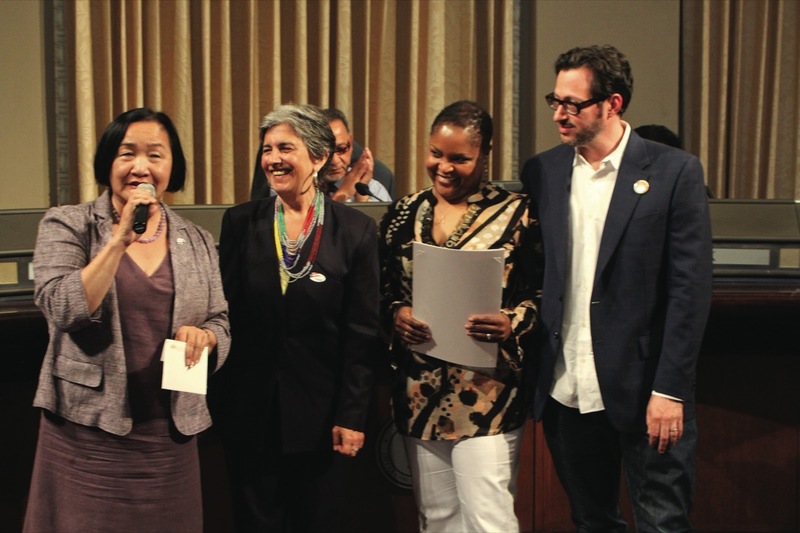 Christine Ahn, “Breaking Ground; The Community Food Security Movement.” Backgrounder, 10, no. 19, 2004. http://www.foodfirst.org/pubs/backgrdrs. Last accessed: 14 May 2010. 3. Young activists and activist scholars have been on the ground in communities like West Oakland trying to facilitate change, create, and illuminate avenues of resistance through their “food justice” work. See Alison Hope Alkon and Julian Agyeman’s edited volume, Cultivating Food Justice: Race, Class, and Sustainability (Cambridge, MA: MIT Press, 2012). 4. This is an issue with considerable complexity and has been debated quite heavily in the popular and academic literatures on “food deserts,“ “obesity epidemic,” “urban agriculture,” and so on. Geographer Julie Guthman’s latest work on this topic is quite useful: Weighing In: Obesity, Food Justice, and the Limits of Capitalism (Berkeley, University of California Press, 2011). 5. 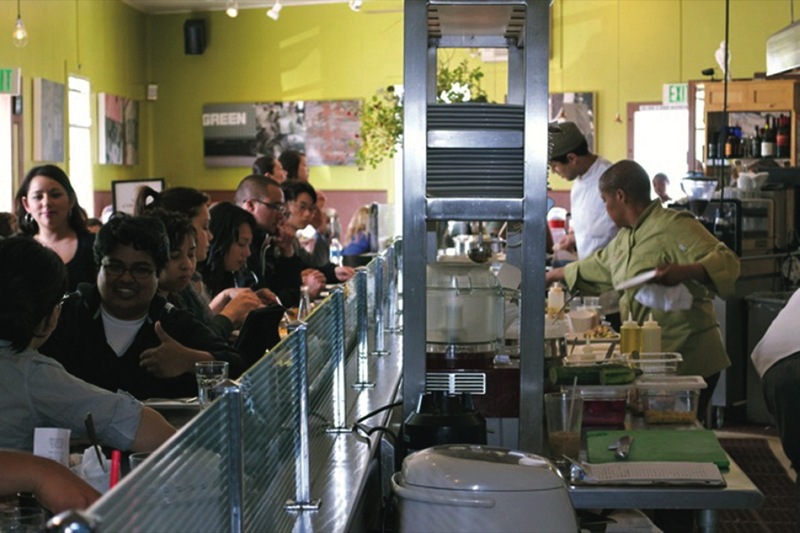 Scott Hocker, “Oakland in Midst of Soul Food Renaissance.” San Francisco Chronicle, 18 August 2004; Karola Saekel, “Long-Cooked Greens Warm the Heart,” San Francisco Chronicle, 12 January 2005. 6. See L. Brenner’s American Appetite: The Coming of Age of a National Cuisine (Harper Perennial, 2000).